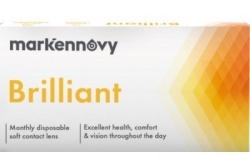 Mark ennovy offers a great variety of contact lenses made with the most advanced materials. Models as Saphir Rx, Gentle 80, Gentle 59 and the new Blu-gen are the best products of the brand. Mark ennovy contact lenses are among the most recognized and valued by users. They are manufactured with the best materials, allowing to wear them for long periods of time. Furthermore, Mark ennovy offers a wide range of prescriptions, adapting to all necessities. The brand has a great catalogue of contact lenses for myopia, hyperopia, astigmatism and presbyopia. Experts recommend the use of Mark ennovy for its great quality. The silicone hydrogel material of Mark ennovy allows high level of hydration through the cornea. Mark ennovy is a european company with offices in England, Spain, France, Germany, Italy and Holland. This corporation has extended its operations in 37 countries in both hemispheres. The brand sells its products exclusively through professional opticians, working with the leaders of the market.